Buy now on DVD from Amazon for only $13.44. Looking for a great family-friendly movie to share with your family this summer? 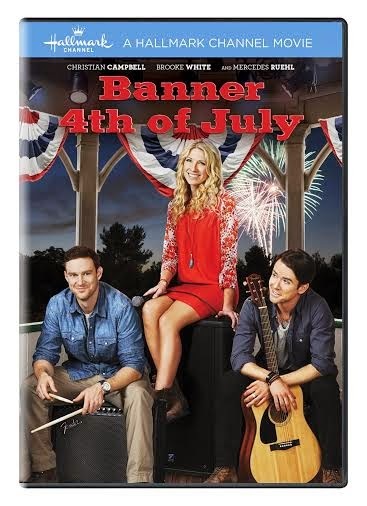 Why not kick off the summer by watching "Banner 4th of July," which stars American Idol finalist, Brooke White, as well as Academy Award®-winning actress Mercedes Ruehl. This heartfelt story, which aired last year on the Hallmark Channel will pull at your heartstrings, and have you reaching for tissues, as watch two siblings come together, and putting their differences aside, to enjoy what matters most in life...FAMILY. I just finished watching this movie, which I had missed when it aired last year on Hallmark Channel, but am so glad I now own it own DVD, so that I can watch it over and over again. Brooke's voice is amazing, and the musical scenes were my favorite, and really worked in tying the heartwarming together together, as we see the two siblings come together and share their love of music, while also sharing their talents with the community. What a way to kick off the summer, as you get ready to enjoy quality time with the family. Here is a trailer of the movie, which originally aired on the Hallmark Channel back on June 29th of last year. "In their late teens and early 20’s, the Banner siblings Mitchell, Desiree and Danny made it big as a rock band, but everything fell apart when Desiree decided to leave the group at the height of their fame. Now, fifteen years later, their mother has a plan to bring the group back together and heal her fractured family. Will the siblings be able to put aside their differences and reunite or will they remain estranged forever?" This looks like one my family would enjoy and I love anything the Hallmark channel puts out.